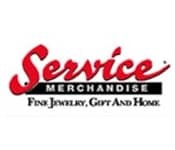 Service Merchandise is a defunct chain of catalog showroom stores carrying fine jewelry, toys, sporting goods, and electronics that existed from 1934 to 2002. The company’s former chairman, Raymond Zimmerman, resurrected Service Merchandise as an Internet-only retailer in 2004 after buying the name and logo at auction, and later forwarded the website to another online store in 2007. The site returned in 2008.